Congress still hasn't dealt with the fiscal cliff and decided what tax rates will be in 2013, leaving companies in the dark about how much to withhold from workers' early January paychecks. Those whose job it is to cut your paycheck like to do it right. They don't like to make best guesses. But they may be forced to unless Congress decides very soon on next year's tax rates. Here's why: Employers that issue paychecks in the first week of January have to cut those checks during Christmas week if not a little sooner. Problem is, unless Congress passes a fiscal cliff deal by Thursday or Friday of next week, payroll processors will be left wondering how much they should withhold in taxes from employees. 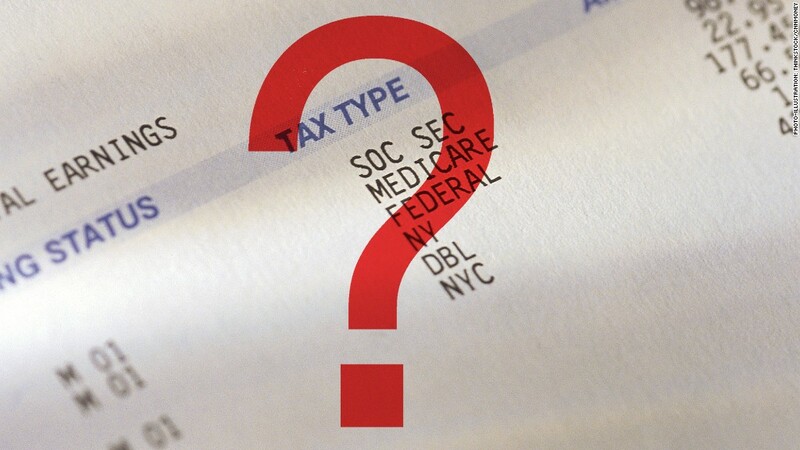 "I wish I knew," said Dennis Danilewicz, senior director of disbursements services at the NYU Langone Medical Center. Given that negotiations between President Obama and House Speaker John Boehner appear to be making little progress, it's very possible Congress won't pass anything next week. Without official guidance from Washington, payroll administrators will likely stick to the 2012 withholding tables for paychecks in early January. "They'll use what they have," said Michael O'Toole, the senior director of government relations for the American Payroll Association. Indeed, they won't have much of a choice. By sticking with the 2012 withholding tables, there likely would be little change in one's pay from this year at least in terms of income tax rates. But, overall, workers will see their take-home pay reduced because processors will follow current law regarding the payroll tax, which funds Social Security. For the past two years, the payroll tax rate -- normally 6.2% -- was reduced to 4.2%. In 2013, it's set to go back to 6.2% on the first $113,700 in wages, up from $110,100 currently. And what if a deal isn't enacted until sometime in January? "It could be two or three paychecks before you realize what you'll be paid [on a regular basis]," Danilewicz said. This is especially true if lawmakers decide to extend the payroll tax cut at a rate below 6.2%. Or if they opt to instead create a new tax cut. And it's especially true for people who make a lot of money because Democrats and Republicans disagree about whether to extend the portion of the Bush tax cuts that apply to income above $200,000 for individuals ($250,000 for married couples). If President Obama gets his way, the top income tax rates on high earners will go up. In that case, payroll processors will have to make adjustments to reduce take-home pay for them.